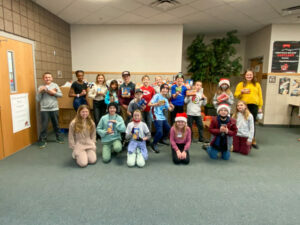 Some students at Midas Creek Elementary School had a unique opportunity to tour a dairy farm in Buhl, Idaho without even leaving the classroom. That’s because the tour was held via a program called Zoom, which is similar to Face Time and Skype. The Idaho farmer gave students in Mr. Gwilliam’s and Mrs. Larsen’s classrooms a live tour and answered student questions along the way. The tours often give students an opportunity to see baby calves, adult herds and how cows are fed and milked. Farms today use a lot of machinery and technology, which allows the tours to touch on STEM careers associated with farming. Kami Greenhangen Jones with the Dairy Council hosts the virtual tours for second, third and fourth grade students. She says when students learn about the work of farmers it helps them understand where their food comes from, how food is produced and how to make healthier food choices.